Deprecated function: preg_replace(): The /e modifier is deprecated, use preg_replace_callback instead in _views_slideshow_preprocess_views_slideshow() (line 73 of /home/rd/html/transit-project.eu/sites/all/modules/views_slideshow/theme/views_slideshow.theme.inc). Deprecated function: preg_replace(): The /e modifier is deprecated, use preg_replace_callback instead in _views_slideshow_preprocess_views_slideshow() (line 76 of /home/rd/html/transit-project.eu/sites/all/modules/views_slideshow/theme/views_slideshow.theme.inc). The aim of TRANSIt is to have a positive impact on the development of Student's Key Competencies by building and strengthening Teacher's competency based education. TRANSIt will achieve this by developing a teacher training approach on the didactics and e-assessment by transversal competencies.The TRANSIt approach will contribute and promote the holistic view of students learning and develop creativity, problem solving, multilingual capacities and other essential learning competencies so integral to student development. 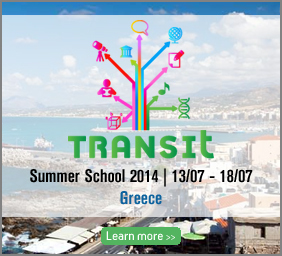 Join the TRANSIt educational community and explore new ways of teaching and learning!